Does money truly make Raspberry happy? The United States does not exist in this fantasy novel. All North American governments have collapsed and have been replaced by the nation of Panem, consisting of a Capitol and 12 districts. Every year each district is required to send two teens, one boy and one girl, to the Capitol to fight to the death in the Hunger Games. The winner and their district get rewarded with money and food. Katniss Evergreen, a 16 year old girl who supports her mother and younger sister buy hunting and trading, volunteers to go to the Hunger Games to prevent her younger sister from being chosen. 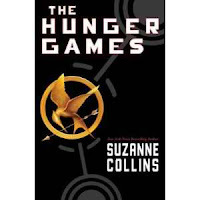 The story of the Hunger Games unfolds with Katniss using all of her survival skills in this futuristic gladiator game. This story is captivating and exciting from Chapter One. I had a hard time putting the book down. Although the book is tastefully written and is not gruesome, the story does deal with death and fighting. Parents will need to be the judge of whether or not their child is ready for these concepts. The money concepts in this book are rather deep ones. Katniss supports her family by hunting and gathering every day and trading these items for money or food. In this story, money is purely for a means for survival. For example, on her best hunting day ever, Katniss used the money from the sell the animals to buy a baby goat for her younger sister. What are your basic necessities? What skills or knowledge do you have that could be used to create an income? How does money effect the outcome of the Hunger Games? Is it fair? "I dropped my gaze, embarrassed, and that’s when I saw it. The first dandelion of the year. A bell went off in my head. I thought of the hours spent in the woods with my father and I knew how we were going to survive." Hope your teens enjoy these books. Do you have any recommended books for teens?